As we begin our Scriptural memorization plan for this year and into the future, it is important to reflect on what Scripture in fact is for us as Orthodox Christians, and thus what it means for us to “read” and “interpret” Scripture. The Latin-based word “scripture,” just as the Greek word γραφή (graphē), can denote any “representation by means of lines,” such as a drawing, painting, writing, and in a religious context, sacred writings. Indeed, the Church Fathers’ preferred term for Scripture is “the divine Scripture[s]” (ἡ θεῖα Γραφή)—a collection of written representations about God, by God, from God, which we are to meditate on, love, and imitate, as the Psalmist says above. Icon —St. Irenaeus, the 2nd century Bishop of Lyons, famously described Scripture as a mosaic with each part—each Testament, each book, each word & syllable—comprising one tile or set of tiles that contribute to the whole portrait of Christ the King. It is the “Rule of Faith” that gives us as Orthodox the pattern to assemble this Image rightly, and not end up with the image of a fox (as the heretics). 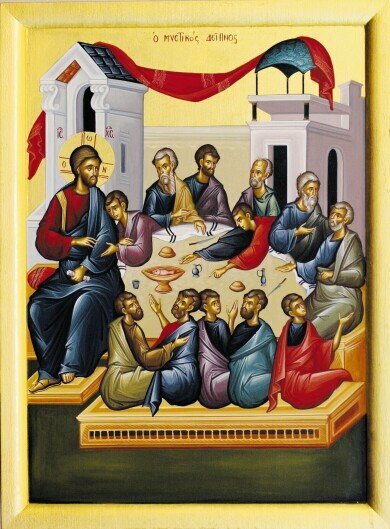 Sacrament—Similar to Icon, saying that Scripture is a Sacrament emphasizes two things: first, that the words (logoi) of Scripture participate in and are a medium for Personal encounter with the Logos, the Word, Christ Himself; and second, that this encounter is a means of deifying grace whereby Christ instructs us and heals us according to His own Image. Script—Scripture is a record of the drama of salvation history, but the true meaning of Scripture is in how we as the Church, by the power of the Spirit, embody the Biblical story in our personal and corporate life now. And that’s the hard part—faithfully playing our role in the ongoing drama of Scripture. But we must first read to know the script!